As part of a schedule revealed by the NRL and Australian rugby league Commission on Thursday, there will be more opportunities for Test matches in both June and at the end of the season between 2019 and 2022. Crucially, the proposed annual Denver Test between England and New Zealand is not included with the Kiwis playing Pacific nations during the representative round for the next two seasons. 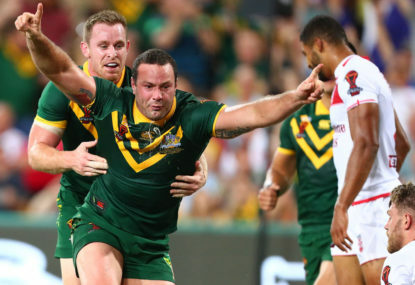 The plan will be introduced to the rugby league International Federation in Singapore later this month, with the idea to grow the global game off the back of last year’s World Cup success. “Until now there has not been enough structure around the international game and the game has missed some real opportunities to showcase rugby league outside of Australia,” ARLC chairman Peter Beattie said. Included in the plan are a new Oceania Cup to be played during next year’s representative round and at the end of the season between New Zealand, Tonga, Samoa and Fiji. “A key to this proposal is we are giving emerging nations a chance to become genuine competitors with tier-one nations,” Beattie said. Meanwhile, the ARLC said negotiations were ongoing for an end-of-year Test between Australia and Tonga in 2018, as well as the planned round zero to kick off next year’s NRL season in the United States.